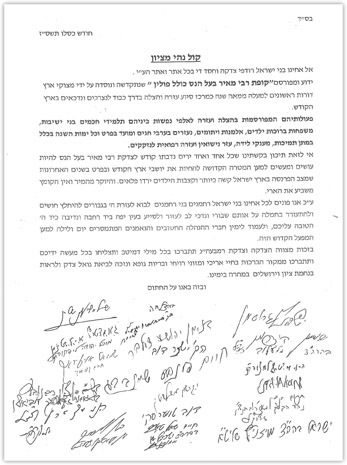 To our dear brothers, pursuers of Tzedoko and Chessed: the renowned fund, Kupath R' Meir Baal Haness - Kollel Polin, established over a century ago by Gedolei Hador, is a center for assistance and support for the needy of Eretz Ylsroel, performed in a discreet and honorable manner. Their work involves saving and assisting thousands, including Talmldei Chachmim, large families, widows and orphans. The fund provides them with financial aid before Yomim Tovim, as well as all year round, in addition to assistance after birth, Hachnosas Kallah, and medical assistance. Thus, we ask that each and every person offer a donation to Kupath R' Meir Baal Haness and take part in the wonderful zechus of supporting those living in Eretz Yisroel. It is now especially crucial, in view of the drastic cutbacks in child benefits and the rise in prices, straining already tight budgets. We turn to you, acheinu bnei yisroel, rachmonin bnei rachmonim, to come to the aid of your brethren, to refuel your compassion and reach out to the deprived among us with generosity and good will. Kindly offer your support to the selfless organization’s managers, who give of themselves day and night for the noble cause. In the zchus of tzedoko, may Hashem grant you brocho, hatzlocho and parnosso, and a long, healthy life. May we all merit to participate in the redemption and comfort of Zion and Yerushalayim speedily in our days.